Two new images from the Herschel Space Observatory highlight the ring-like swirls of dust that fill the Andromeda galaxy. The new eye-catching views from the Herschel space observatory are fit for a princess. 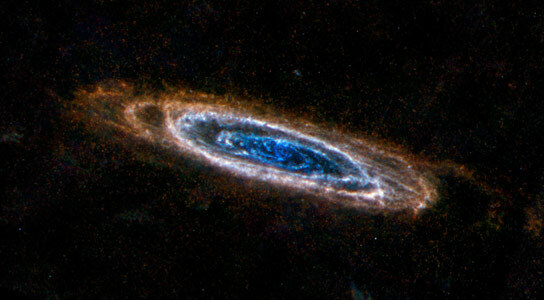 They show the elegant spiral galaxy Andromeda, named after the mythical Greek princess known for her beauty. The Andromeda galaxy, also known as Messier 31, lies 2 million light-years away, and is the closest large galaxy to our own Milky Way. It is estimated to have up to one trillion stars, whereas the Milky Way contains hundreds of billions. Recent evidence suggests Andromeda’s overall mass may in fact be less than the mass of the Milky Way, when dark matter is included. 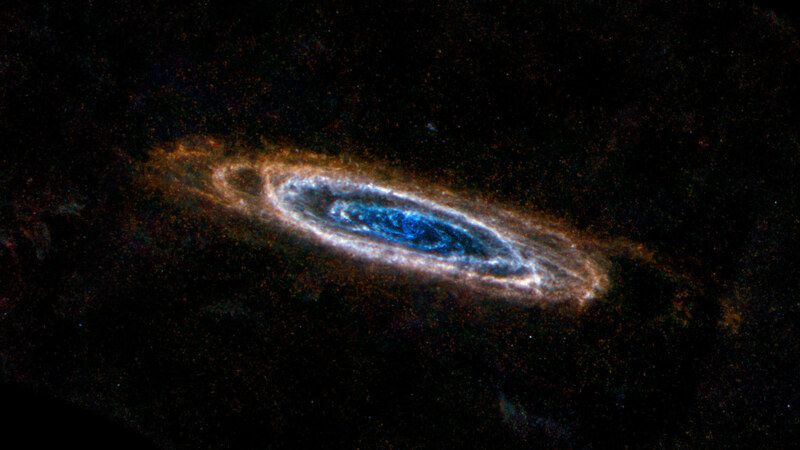 Herschel, a European Space Agency mission with important NASA contributions, sees the longer-wavelength infrared light from the galaxy, revealing its rings of cool dust. Some of this dust is the very coldest in the galaxy — only a few tens of degrees above absolute zero. In both views, warmer dust is highlighted in the central regions by different colors. New stars are being born in this central, crowded hub, and throughout the galaxy’s rings in dusty knots. Spokes of dust can also be seen between the rings. 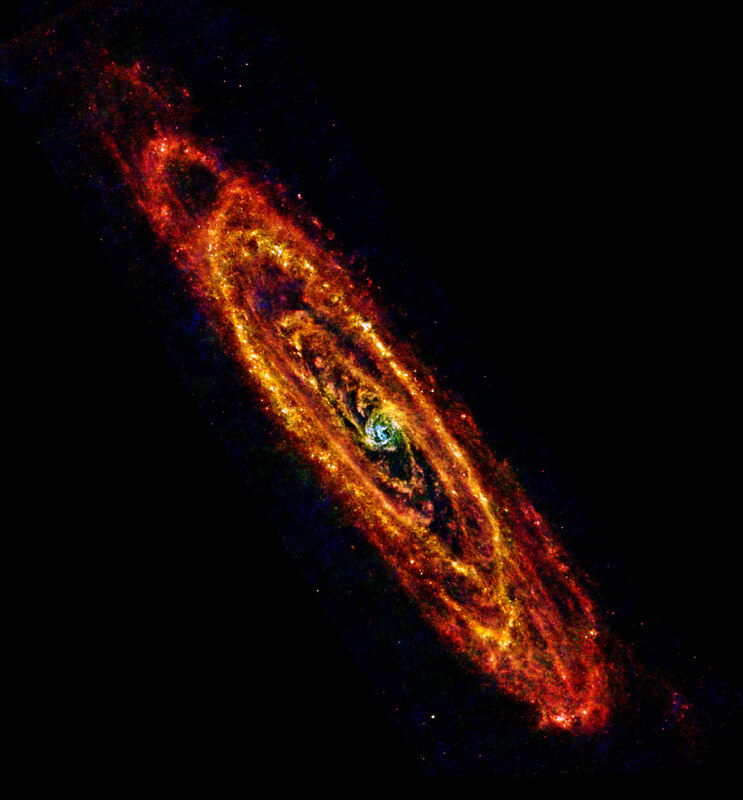 One view, seen above , is a mosaic of data from Herschel’s Photodetecting Array Camera and Spectrometer (PACS) and spectral and photometric imaging receiver (SPIRE). The second view, top of post, shows data from only the SPIRE instrument, which captures the longest of wavelengths detectable by Herschel. Be the first to comment on "New Herschel Images of the Andromeda Galaxy"